Others also gather the courage to say what they want from life: I want to have a puppy. A real gun to defend myself in case of trouble. I want to be the greatest boxer. I want a legal job. I want to go for a walk with my sisters and my family. I want to have a child. I also want to have a house to live in. I want freedom. I want to have parents. These wishes belong to some of the 67 beneficiaries from the Residential Rehabilitation Center for Youth with Neuropsychological Disorders Băbeni. The institution is located in Vâlcea, a county in the central-south area of Romania. The youngest beneficiary is seven years old, the oldest is 23. Most of them have special educational needs certificates. 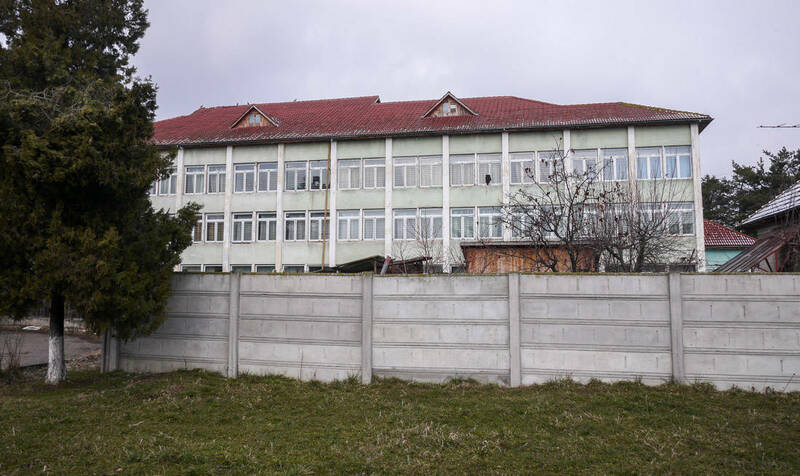 The gymnsasium pupils go to the special school across the road, the older ones having to study 36 kilometers away, in a village. 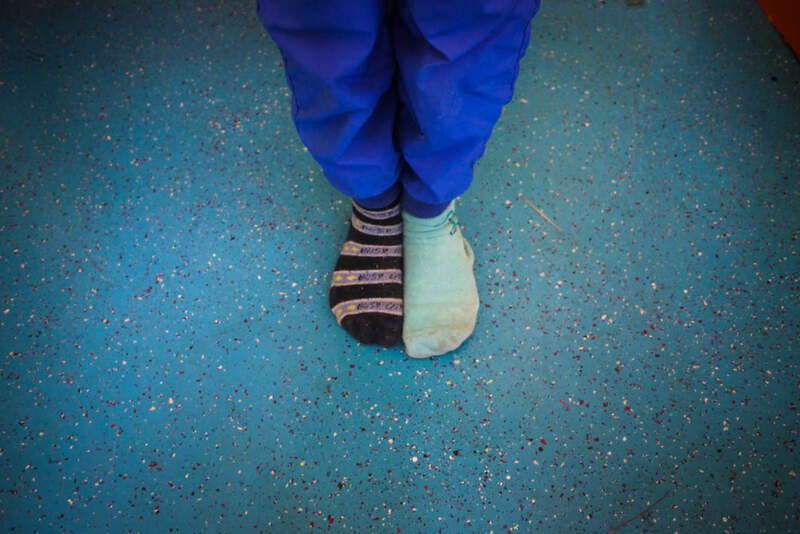 Only one of the teenagers from the Center goes to the regular school, even though not all of his colleagues have special needs. Some are completely healthy, but they were brought here along with their brothers, sisters or colleagues from several orphanages. Almost all of them have been abandoned by their parents. This spring, I spent 10 days with them, as an undercover journalist. I was „lady Oana, the volunteer“. 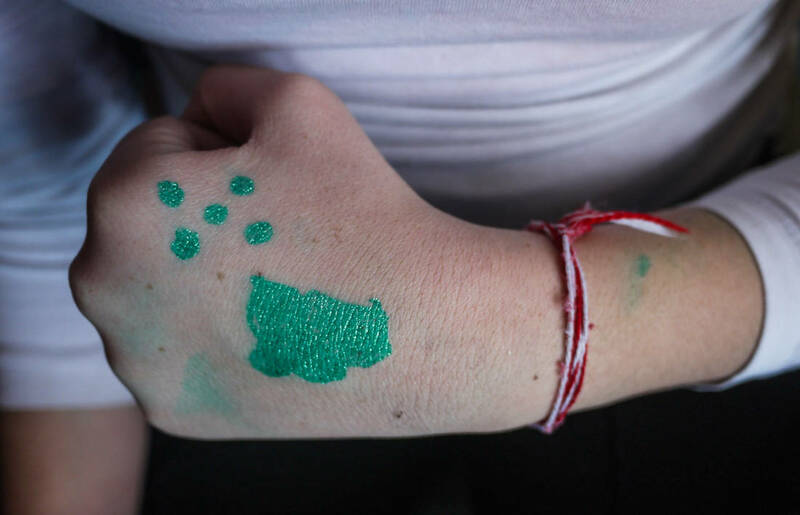 We crafted March trinkets together (an old Romanian tradition), we played, we painted. I saw them fighting and threatening each others with knives. I witnessed how they are bound and sedated, how they are not being taken care of or rehabilitated, but kept hidden away from the society. I get off the bus 20 kilometers away from Râmnicu Vâlcea, the capital of Vâlcea county. I pass between two high voltage pillars that buzz like wasp nests and I see an old building with new windows, surrounded by pines. This is the Center. I open the black gate, it squeaks; I pass some coloured benches, rocking chairs, swings and a slide. 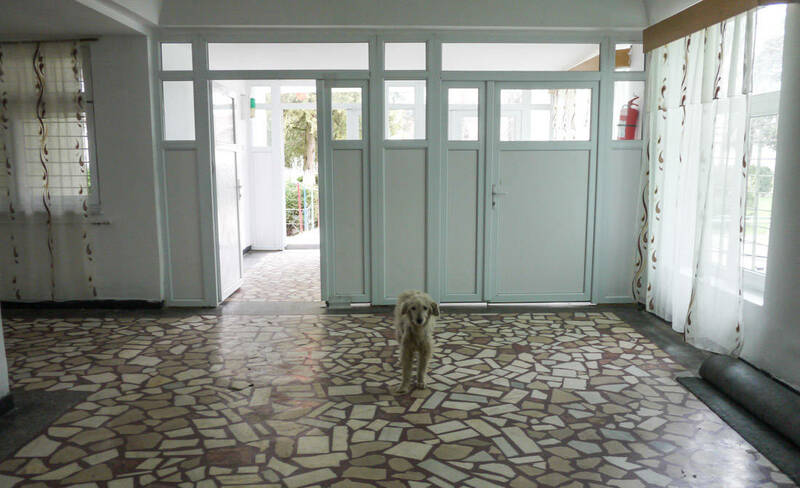 I enter the white, double glazed doors, right below the Romanian and the European Union’s flags. I step on the mosaic from the ground floor and climb up the worn-out steps to the boys’ floor. On a white wall, there is a panel where the institution’s objective is written: „Obtaining a degree of autonomy that will enable the bebeficiaries to integrate themselves into the family and community“. One can hear, among with loud Balkanik rhythms, the sounds of a hair cutting machine. A boy is giving haircuts to his colleagues. ‘How much money do you charge for this?’, a nurse asks. ’15 lei’, the boy answers. ‘More than at the hairdresser’s!’ ‘Well lady, we’re not at the hairdresser’s, we’re at Neuro’s’. On the next floor, through a crack in the door, I can see a skinny girl with very short hair. She is rocking herself in a bed and she is looking at the sky through the window bars. The sun is shining outside, but she doesn’t go out for a walk with all the others. She can’t, because she is tied to the bed foot with an improvised rope made out of thick stockings. She rolls over to the edge of the mattress, almost falling off the bed, but two colleagues catch her in time and lay her down on the floor. She takes two steps, then falls on her knees. Other three girls are on the other beds in the room – one is also rocking herself, naked, with her feet tight to her chest. The other babbles something incomprehensible. Another one screams. The nurse in the hallway is at the window, smoking a cigarette, and doesn’t hear anything. She cannot supervise them all alone, so she ties ”one of the bad ones, so that she doesn’t get lost“, while she leaves the others on their own. The rehabilitation educator says the tied girl is one „who barely walks… All she can get her hands on she wants to bite, to stuff into her mouth. I can’t do anything with her for more than 15 minutes.“ „We do practice restraining“, admits the psychiatrist who prescribes medicine for the children. „We have a written law that states that we can restrain children, but with specific restraining means“. LAW No. 372, ART. 21 (1)By restraining, in the spirit of the present norms, we understand the restriction of one’s freedom of movement by using adequate means to prevent free movement of one of the arms, of both arms, of a foot or both feet or to completely immobilize the patient, by specific protected means that do not cause physical harm. (3) Restraining cannot be used as a punishment or as a means to replace the lack of staff or treatment. I told what I saw in the Center to Daniel David, the director of the Department for Clinical Psychology and Psychotherapy from the Babes-Bolyai University. The situation seemed worse to him than in the eyes of the authorities. It is a rehabilitation center, but it works like a detention center. 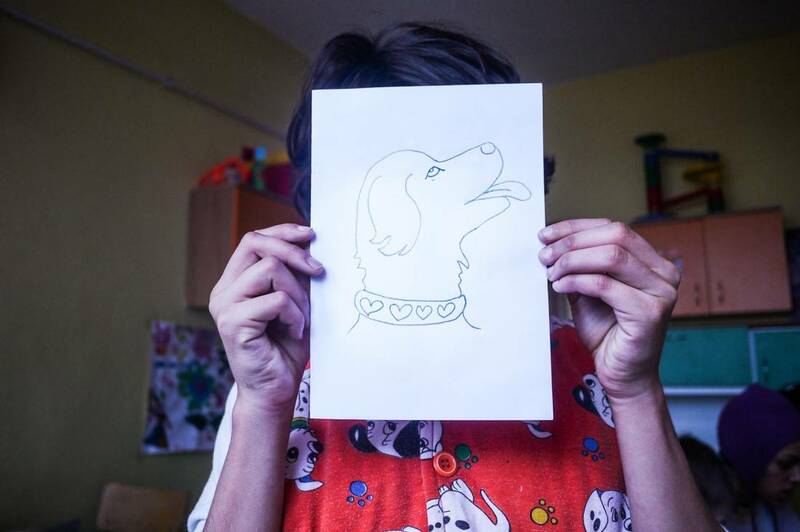 As “treatment“, the children and teenagers receive neuroleptic pills, without any therapy. Most of them see the pills as forms of punishment, because they make them sleepy. 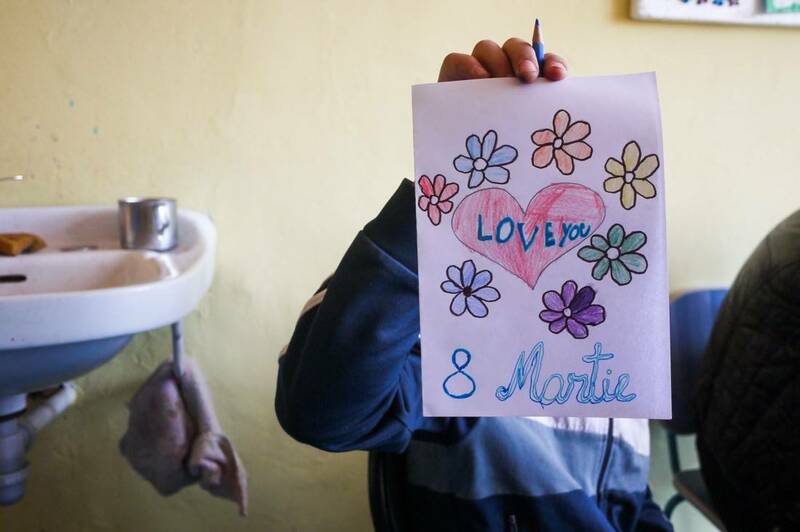 Similar things happen in other Romanian psychiatric institutions too: a child was infected with HIV in the Psychiatry Hospital in Poiana Mare, taken from place to place, and then left to die. 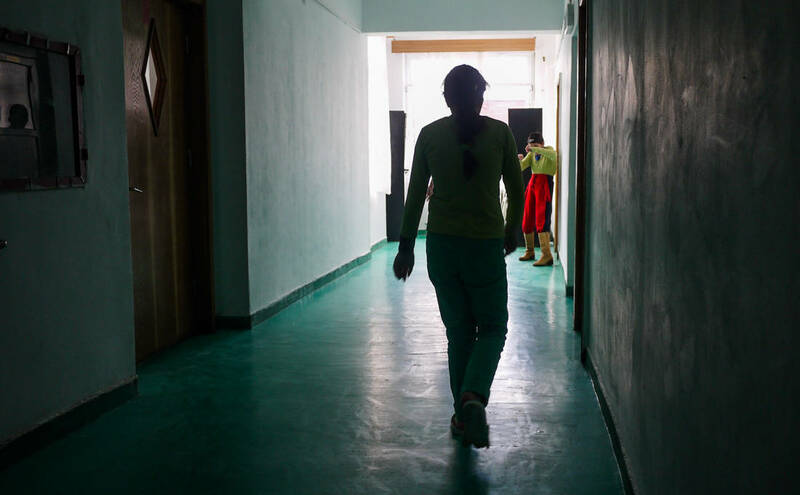 In Vâlcea, out of the 38 people who exited the residential centers for people with disabilities in 2014, 28 adults and a child have already died. The European Union says that centers like these should no longer exist. 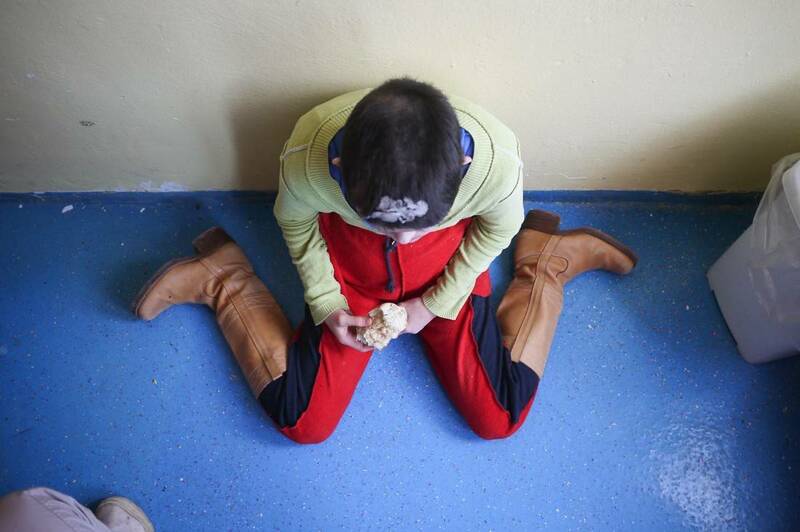 The Romanian state acts as if children with special needs should no longer exist. The colorful room opens with a key on a Statue of Liberty keychain. 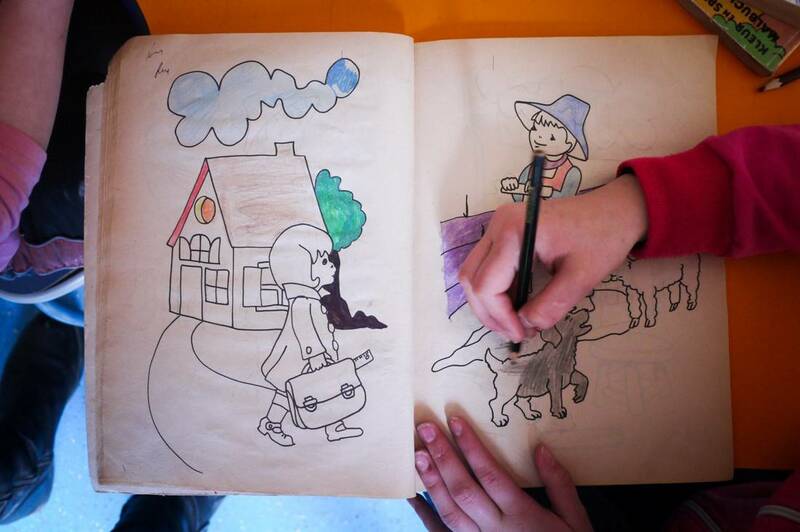 Twice a week, children come here to have art therapy with the only rehabilitation educator the Center has. 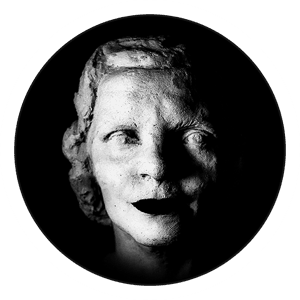 They draw, cut up forms or model in clay. In those 10 days I spent with them, I taught them some games. One is with paper planes – the kids write on a wing things about themselves and on the other wing things they like to do. 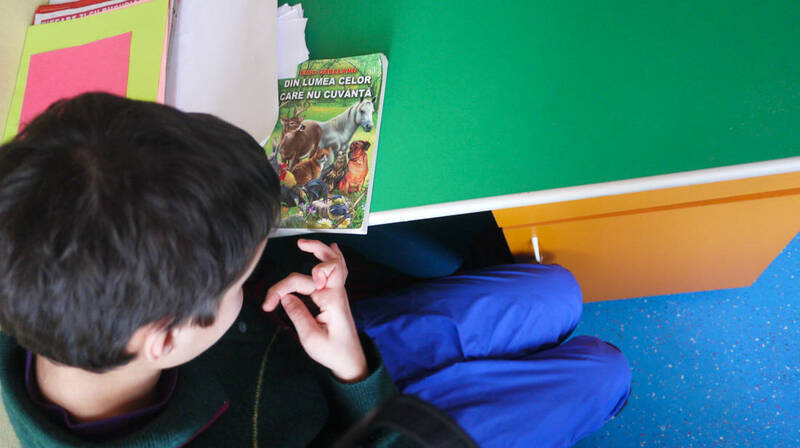 Ștefan, the boy with the mohawk, reads Marius’ self-characterization. -‘A normal person!’, adds Marius. Zbang! Marius hits him in the ribs. -‘Don’t hit me!’, asks Ștefan. The boy hit in the ribs tells me he has ADHD and that he was placed for adoption 10 years ago. He says he never had a nice day at this center. Marius is told to be the terror of all the younger colleagues since he came here, a year and a half ago. He brags that he was kicked out of the previous center because he hit the educators. Marius turns his curly neck to the ladies, puts his headphones on and keeps the balkanik rhythm with his fingers and hips. On the right side, his trousers take the shape of the knife. A 17 year old boy who has traced all the veins on his hands with a blue pen says I have no idea where I’ve landed.“We live by the law of the jungle here, lady“. By the “jungle law“ live the children and the eight nurses on each shift. Earning minimum legal salary for their 12 hours of work per day, day and night, they take turns playing the role of mothers, victims and executioners. -I’ll throw it up, says the kid. -Hey, you do what I say! Take some water, don’t mess with me. -Come on Sorin, take the pill, I’ll shove it in your throat otherwise! Neuroleptics like Risperidone cause drowsiness, dizziness, headaches, uncontrolled movements, tics, depressive states. According to a study from the Alberta University in Canada, the effects of long term treatment are not known for children and adolescents. -About the medications you prescribe, Rispen and Strattera, they have lots of side effects. -All medication has side effects. What are you referring to specifically? -These are pills that help. I haven’t encountered children with depression on it. One in a million maybe had a depressive episode. The Health Ministry would have taken them off the market if they had been bad. All medicine has side effects, but they do not endanger life. -For how many years can one take Risperidone? Dear mother, I love you! How are you? Are you working in a shop now? What are you doing home? Are you ok with my sister? How’s the daughter in law? Are the boys ok? Alex, do you love me? A lot? I love you lots. Dear grandma, how are you? Grandpa, how are you? I wish you all the best. How’s uncle? Are you ok? In another room, a choir of abandoned children have a rehearsal for Mother’s Day celebration. Ștefan, the boy with the mohawk, raises his fist at an imaginary mother to threaten her. He laughs. His fist hits the air. -Lady, why are we singing this song? We don’t have any parents, asks Ștefan. -What am I to you then? Who takes care of you the whole day long?, answers the educator. -These stupid women! He points to the nurses. They don’t even blink. On the 7th of March, after three days of rehearsals, the educator cancels Mother’s Day celebration. There’s a chicken pox epidemic and many children are isolated in their rooms. On the 6th of April, a delegation appears in the Center. After I have shown them the images with the girl tied to the bed, a TV crew and the second in command of DGASPC Vâlcea, Antonie Ceaușu, go up to the second floor. They go directly to the girl’s room. For the first time I don’t see her tied with stockings to the bed, now she is dressed with them. She lies on her back and plays with her feet in the air. At the request of a reporter, Ceaușu accepts to undress the girl. From under the stockings, over her ankles, two rings of bruises appear. Those are the wounds that show just how long she had been tied to the bed, although a nurse says the contrary. Ceaușu turns red in his face and the director of the center, Cristian Dima, is also red with anger. He defends himself, saying he has occupied his position just 3 months ago and not even full-time. He doesn’t even believe what he can see with his own eyes and he does not want to give any interview. He promises to undertake “serious measures”. It’s a sunny morning and I am walking among the tall trees and the people waiting in the yard of the Hospital No. 2 in Râmnicu Vâlcea. I have just finished the last interview of the investigation. In my pocket I have a red folded paper. Handwritten, shaken letters wish me a ‘happy and beautiful life. I love you lots’. 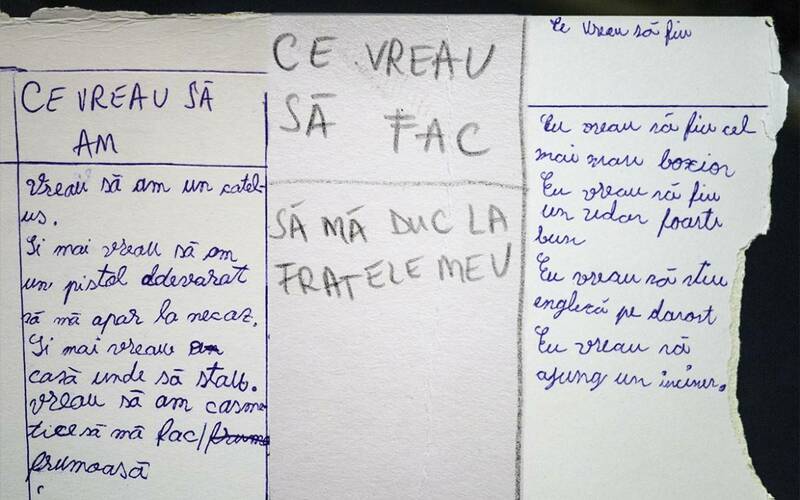 The children in Băbeni run through my head and I shiver when I think that I won’t go back there. Miss Oana the volunteer won’t be their balloon dealer anymore, she won’t ask them about dreams and she won’t calm them down after they’ve been beaten. I head towards the hospital gates. I look to my left and to my right. I wince. Cristian Dima, the director of the Center in Băbeni looks at me from few meters. When our eyes meet, he also winces and hides behind a tree. Thank you to those who kept me from going insane while working on this project. This investigation took place with the support of the Centre for Legal Resources.